If ancient church records can be believed, Baptists have not always enjoyed singing in church, especially those songs of “human composure.” But is was a Baptist pastor who is considered to be the leader in establishing the idea of congregational singing versus the established Metrical Psalm singing that was currently in use in all the churches. It was during the English Reformation that all hymns had been removed from the service of the Anglican Church in preference to Metrical Psalms. This became the practice not only in the established Church of England but also in the Dissenting Churches such as Baptists and Congregationalists. Of course, Baptists were not the only group with this discussion taking place. Luther’s attitude was that God’s people should use whatever they could to praise Him as long as it was not contrary to the teaching of Scripture. John Calvin had a more restricted approach. He taught that Christians should use only what was contained in Scripture. He was the leading proponent of the practice of singing metrical Psalms only. That practice became the songbook of English Protestants up to the time of Pastor Keach. Sometime later in 1668, Keach was called by a small Particular Baptist Church to be their pastor. They met in a private house but after the Declaration of Indulgence in 1672, a meeting-house was erected in Southwark. Apparently, the Lord blessed the work. He remained there for 36 years as their Pastor and the building expanded several times. It was as representative of this church that Keach went to the 1689 General Assembly and subscribed the 1689 London Baptist Confession of Faith. Hymn singing continued to be a very controversial practice, but Bro. Keach and others persisted, and hymn singing eventually became generally accepted thanks in large part to the publication in 1707 by Isaac Watts of his “Hymns and Spiritual Songs”. 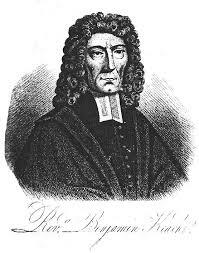 Benjamin Keach remained pastor of the church at Horsleydown until his death, which occurred July 18, 1704. His funeral sermon was preached by Rev. Joseph Stennett.